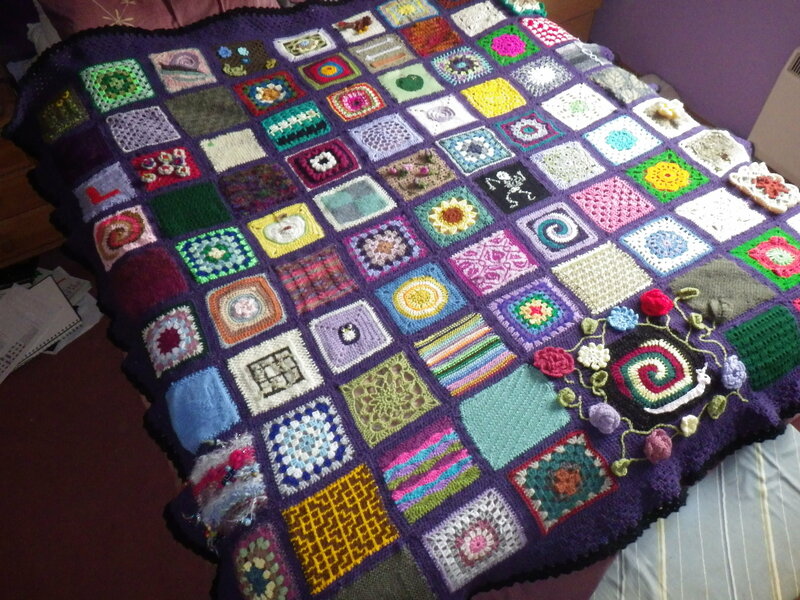 I loved putting together my masterpiece blanket… the joy of creating an object with contributions from friends around the world. I sit on it every day as it adorns the chair where I do my editing work and where I write. The trouble is, I’m sitting on it, so I don’t get to see it much. Even so, I feel cocooned in the love and creativity that went into making it. Over the months, I have continued to receive more squares which will eventually be put into another friendship blanket for the ‘latecomers’… do let me know if you’d like to contribute a square. However, I have recently developed the desire to enjoy seeing more of the work of my talented creative friends and so I have decided to decorate my work room with their (your) art. I already have Dani’s snowflake bunting adorning my bookshelves, although I might move it to show it off better. A while ago, Kerry (Love those hands at home) sent me an antique piece of crochet ad recently I bought one of Anne Lawson‘s beautiful feather pictures. And, most recently, I received a wonderful, original mixed media piece from Pauline (The Contented Crafter) entitled Grow where you are planted. The latter is a swap – I admired this picture when she wrote about it on her blog, saying I would hang it on my wall in a heartbeat. Apparently this is the greatest compliment any artist can be given and so she offered to swap the picture for a crochet dragon. The latter is a work in progress, but her picture arrived here last week. This post is wonderful! Great work. You’re welcome. (-: Keep up the amazing blogging and if you get bored check out my blog. I write short stories and character interviews readers can interact with. Your hats often inspire me! I am looking at your square in the blanket… it’s visible because it’s just on the chair arm by my right hand… most of the ones under my bum are my own!! Oh WOW!! It came up so nicely. I love your choices for the matting and frame! I always enjoy seeing what people do for the framing as the right one makes the work pop and this sure does pop! The antique doily is also a hit in my book! Your framer is a keeper too! ‘I’d hang it on my wall in a heartbeat!’ is absolutely is the best thing I can hear about my work! Everyone says ‘I love it’ but I have come to realise that is just like hearing someone say ‘II’m fine thank you’ It may or may not be true. I love the swapping of our makings – it is such a lovely thing to do! The work room is making a great display room and the masterpiece blanket still looks stunning. The choice of the green frame on Pauline’s work was inspired. Love the idea of a visual reminder of your friends, and the fact that the Masterpiece is a cushion under you and behind you – your friends have got your back, as it were! This is lovely 🙂 I also loved that work by Pauline and have one of Dani’s buntings still up though Christmas is well gone, it’s too lovely to take down. How special! Wow. Art from your friends and a local framer! That’s the way things should work. It looks wonderful, Jan! That lovely old piece of crochet has found the perfect home! And how great for you, to be surrounded by thoughts of friends at all times! I’m over the moon with how it looks now it is in a frame. For ages it sat on a shelf and I occasionally picked it up and admired it. I was really reluctant to use it in case I spilled coffee on it or something. Then, when I started thinking about having Pauline and Anne’s pictures framed, I wondered whether I could have that doily transformed into something to go on the wall. When I took it to the framer, she loved it and so did her friend who was in the shop. Then when I went to pick it up, I was just bowled over by how lovely it looks. Thank you so much for sending it to me… I’m delighted to have been able to give it a new life. I worked for years as a picture framer and we used to do all kinds of creative mountings of textiles so seeing the doily done up that way makes me smile. I like the choices you/the framer made–very understated so the detail of the crochet is the focus. Again, I’m so pleased it’s in your care! Lovely. You know what would be good? A poster/print of the masterpiece to go on my wall! The thought of artwork done by friends surrounding you is heartwarming. I have a piece of Pauline here too and it’s hanging in my den, unframed. I kind of wanted people to be able to touch it because of all the texture. I’m still catching up on my reading but glad I didn’t miss this one. I have several old doilies that I wanted to put into a quilt or a shadow box. So many projects, so little energy right now. Soon though. I love your masterpiece. I have a quilted version waiting to be finished.